A diagnosis of schizophrenia is often taken to denote a state of global irrationality within the psychiatric paradigm, wherein psychotic phenomena are seen to equate with a lack of mental capacity. However, the little research that has been undertaken on mental capacity in psychiatric patients shows that people with schizophrenia are more likely to experience isolated, rather than constitutive, irrationality and are therefore not necessarily globally incapacitated. Rational suicide has not been accepted as a valid choice for people with schizophrenia due in part to a belief that characteristic irrationality prevents autonomous decision-making. 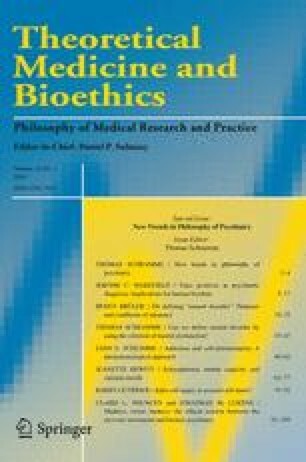 Since people with schizophrenia are often seen to lack insight into the nature of their disorder, both psychiatric and ethical perspectives generally presume that suicidal acts result directly from mental illness itself and not from second-order desires. In this article, I challenge notions of global irrationality conferred by a diagnosis of schizophrenia and argue that, where delusional beliefs are unifocal, schizophrenia does not necessarily lead to a state of mental incapacity. I then attempt to show that people with schizophrenia can sometimes be rational with regard to suicide, where this decision stems from a realistic appraisal of psychological suffering.